Knowing exactly what to study for any exam is daunting. There's so much information out there, how can you possibly know what will be on the test? Series 7 Exam For Dummies, 3rd Edition with Online Practice Tests is a critical reference if you're prepping for your Series 7 examination. Packed with the latest information associated with this test, as well as proven test-taking strategies that are focused on maximizing your score, this easy-to-use and comprehensive text has been updated to support you in your test taking preparations. The Series 7 exam is no joke — with 250 questions administered in two three-hour blocks, this test is certainly a challenge. Studying for your Series 7 can be intimidating, but with the proper preparation you'll be able to enter the exam room with confidence. 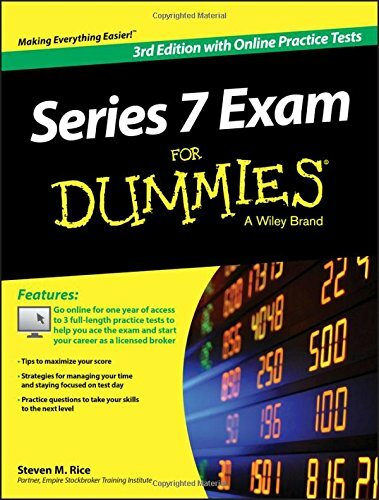 Series 7 Exam For Dummies, 3rd Edition with Online Practice Tests is a fundamental resource that guides you through your preparations for the Series 7 exam.